Fantastic prose. The author’s narrative voice adds the spark of life to this dystopic, cyberpunk world. While the book’s not openly comedic, the kookiness of the setting adds a certain humor to the story. Sympathetic main character. Opal is a mage who’s down on her luck, forced to work the dirty job of a cleaner of abandoned apartments. She’s doing her best to pay off her student loans, trying to stay one step ahead of her despicable loan-shark father. She has a vibrant personality which sings off the pages. Good side characters. Opal’s AI bff is a good ‘only sane man’ character, while Opal’s cyborg partner is a good straight man. The super-cyborg lady was particularly droll. Overall high level of polish. I listened to the audiobook, and the voice actor added a good amount of depth to the story and characters. This is a dystopic, Science Fantasy, Cyberpunk sort of book. There are wizards with cybernetic implants, dragons who hold day jobs, universities where you can earn a liberal arts degree in Magical History. I liked the setting, but I can understand that not everyone would. If you’re not in the mood for that sort of thing, then move on to another book. The pacing was a bit iffy towards the middle. It wasn’t bad, the plot only lulled for a little while, but it was there. In summary, I liked this one a lot. This is probably going to be in my top 10 books I read this year. 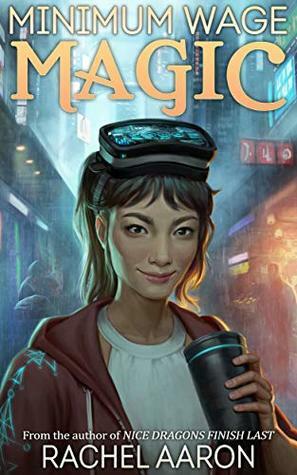 I was super impressed with the author’s narrative voice and how she perfectly encapsulated the mood of a cheerful cyberpunk dystopia. This is a book about cyborgs and dragons and dystopic Detroit. This is a genre novel at it’s most prototypical: fun, giving you a bit of intellectual weight but not too much to bog you down, with sympathetic characters and a vibrant setting, with a tightly written plot and sufficient foreshadowing to create structure. This book is an unpretentious good time. The author knew what she wanted to write about, and she did a damn fine job of it. My complements to Rachel Aaron. I’ll be reading more of her work soon.